Tags: idle, champions, update, event, Liars' Night, Krond, spotlight. Krond was originally released during our first Liars' Night event in 2017. Initially, he was seen as a powerhouse thanks to his strong Ultimate. Unfortunately, an error in the calculations for the Ultimate happened to sneak through our QA pass, so we had to dial him back. It was all downhill for Krond from there. We don't normally like to "nerf" champions, but the bug presented us with a choice we had to make and so we toned down his power. 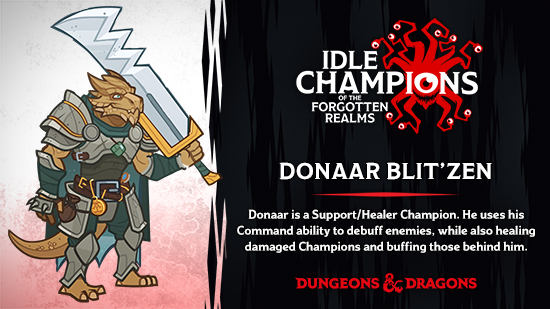 Between that tweak and the design idea that we could split the power level of his cantrips between 3 equipment pieces, he was seen as a sub-par Champion for much of the past year. As we started our TLC pass for Liars' Night, we had a discussion on if we should wait for a big rebalance pass, or use the coming event to give Krond some redemption. We decided to take some time to work on him now, bringing some newfound glory to our Half-Orc Fighter. These changes are live in the game as of the Grand Tour 6 update today, so everyone who has Krond can have a week to get used to him before he's available for everyone in Liars' Night Y2 starting next week! We started by looking at Krond's slot, and how it has grown this year. Evelyn is a go-to tank in the meta, so a sub-par DPS just wasn't going to cut it. Additionally, Krond is a CNE-exclusive Champion, so we have a bit more leeway to make major changes to the character. Given that, we wanted to take a look at the champion from the ground up. Knowing what is coming in the upcoming Tanking & Healing update allows us to do a bit of future design with nu-Krond. We started by creating a new Formation Ability titled Survival of the Fittest. Because everything in his design is tied to his specializations, we wanted to give him a "build around me" ability that might make you think about a different formation. We decided that Krond has been looked down on for so long that he's probably pretty cranky. He's missed out on a TON of adventures and he's ready to create his own crew. Survival of the Fittest was born from that idea: Krond's damage is increased 100% for each champion in the formation (multiplicative) who is Evil (Arkhan, Jarlaxle, and Makos at the moment), or has a Strength score of 16+ (Arkhan, Azaka, Barrowin, Binwin, Donaar, Jamilah, Krond, Minsc, Tyril, and Wulfgar). Eventually, this should allow Krond to create a new formation type, focusing on heavy hitters and evil Champions. 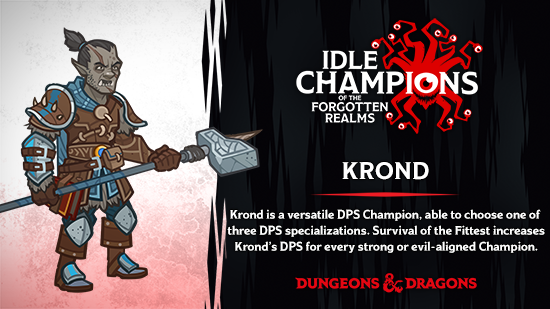 Given his new focus on strong and evil Champions, we imagined Krond benched from almost all adventures and quietly stewing and working out. We increased his Strength to 18, and tipped his alignment from Chaotic Neutral to Chaotic Evil. That's right. Nu-Krond isn't messing around! 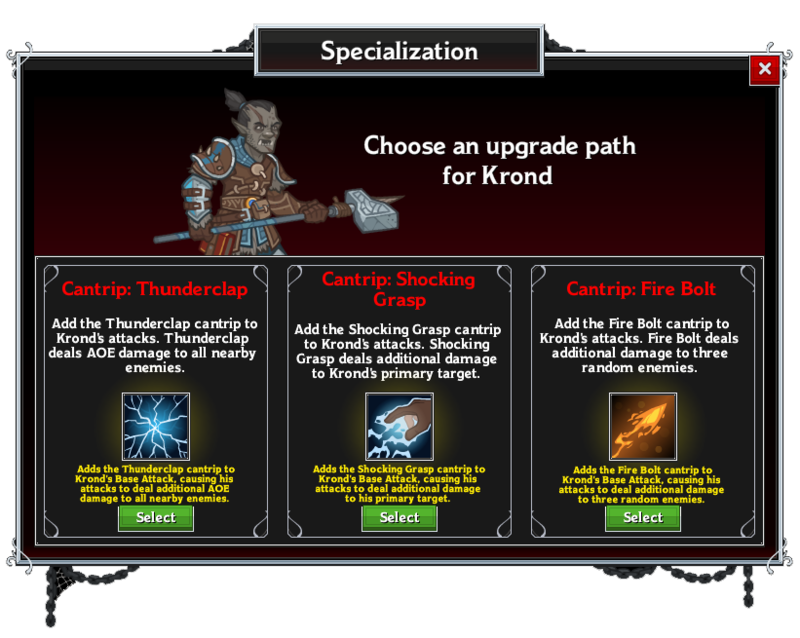 We wanted to break Krond's equipment away from the focus on his specializations. So we merged the 3 equipment items that each boosted a single cantrip power into one equipment item that boosts Krond's chosen cantrip. With the 2 extra equipment pieces we gained, we gave Krond another self DPS equipment item and an item that increases his bonus from Survival of the Fittest, pumping up his power level. In balancing his damage, we decided to shave a half second off of his base attack cooldown, lowering his cooldown from 5.75 seconds to 5.25 seconds. We also doubled his base attack damage. We buffed upgrades to Eldritch Strike to give Krond's follow-up attacks more of a kick, positioning Krond as a DPS who excels at longer drawn-out encounters. We also increased the damage modifier of Krond's Thunderclap and Fire Bolt cantrips, though his Shocking Grasp is still the best bang for your single-target buck, if that's your thing. While Krond's original ultimate packed quite the punch, we had to dial it back in a major way shortly after he was released. We've fine-tuned his Arcane Charge for a better balance between over-powered and feather-tickling. In the end, our entire focus was to pull Krond out of the DPS dead zone and get him in fighting shape. As we mentioned above, we're aware of some of the tanking & healing updates we'll be making, and we were able to take into account how much better new Arkhan is going to be. We're confident you'll be satisfied with nu-Krond's power level, and even happier when nu-Arkhan comes around in the coming weeks. We'll be watching the discussion online and on discord to see how well he's received, so let us know what you think on Facebook, Twitter, or on the official Discord! 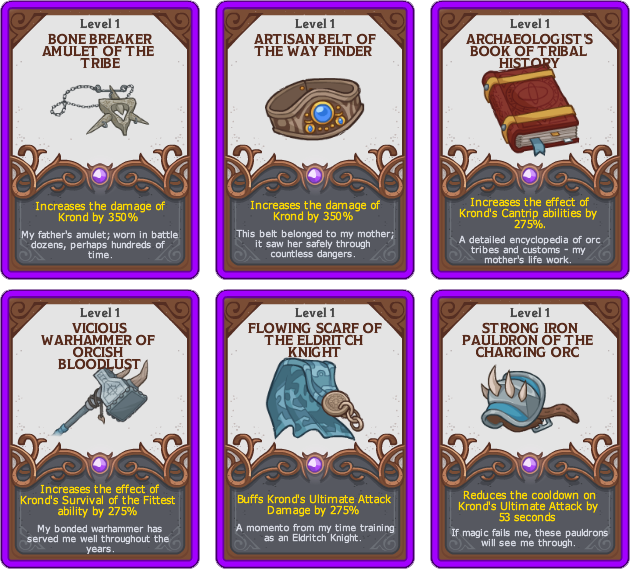 Idle Champions Event: Liars' Night! Tags: event, idle champions, liars night, krond. October brings our first Halloween event to Idle Champions: Liars' Night! This limited-time adventure runs from today until Noon PST on Monday, November 6th 2017, and introduces Krond, the Half-Orc Eldritch Knight! When you want to add Krond to your party, you can swap him with Asharra. Added the Liars' Night event, our second limited time campaign event! The event will run until Monday, November 6th at noon PST. Added a new Champion: Krond, the Half-Orc Eldritch Knight. Added a new event Divine Favor: Leira's Favor. Several Champions have had their stat blocks updated, however, none of the changes affect any existing abilities (e.g. Hitch's "Friendly") at this time. Champions with multiple components to their attacks (e.g. Hitch with daggers) will now show their base Damage with both parts separated: "XXXXX+YYYYY Damage" to make it easier to determine how much damage each part of the attack will do. Updated the Seeking Allies adventure icon in the Tomb of Annihilation campaign.